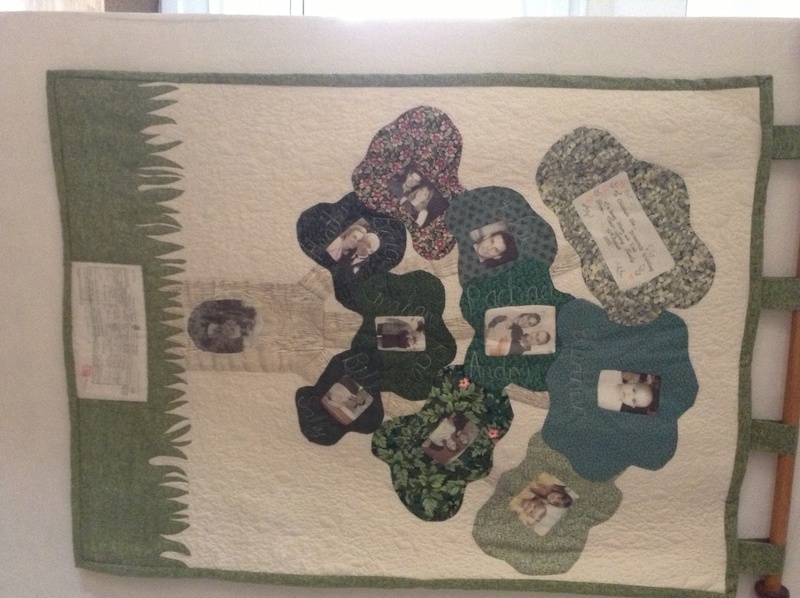 Thread: Has anyone made a family tree quilt using embroidered names and birthdates? I was thinking that I'd like to make something for my parents including the names of their 5 children and all their grandchildren--with all their birth dates. But I'm kind of at a loss for ideas. I could just do simple blocks with the names embroidered (have an emb. machine) or find a picture to embroider and then put the name. But I'm really coming up empty on ideas for this quilt, but would love to work on it. Has anyone made something like this? I made one years ago when I first started quilting. I put a yellow sun in the center of the quilt. Background was sky blue. 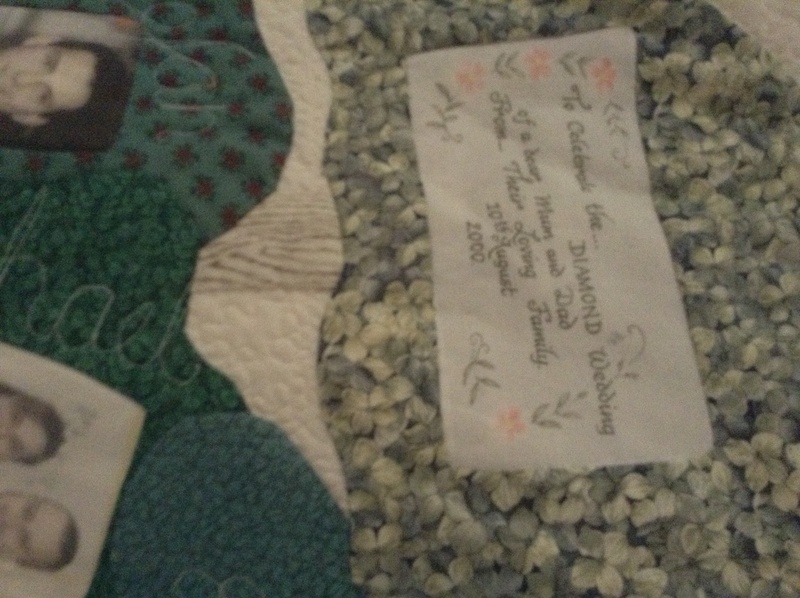 Using embroidery floss, I embroidered the parents names and the date of marriage on the sun. I did blocks around the sun. For the blocks, I appliqued soft white clouds (cut free hand). I embroidered the children's names with floss and added the each spouse's name and, where applicable, I added maiden names. I cut yellow butterflies and used floss for the grandkids names. I appliqued the butterflies around the blocks. Last edited by ranger; 06-22-2013 at 12:59 PM. My friend did one and she used her embroidery machine to stitch out the names and dates on green fabric. She used a solid large piece of green and after all the names were finished, she cut them out in leaf shapes to appliqué onto her tree. This allowed for further leaves to be added as new family members arrived. Here is a family tree I did for a neighbour a few years ago. 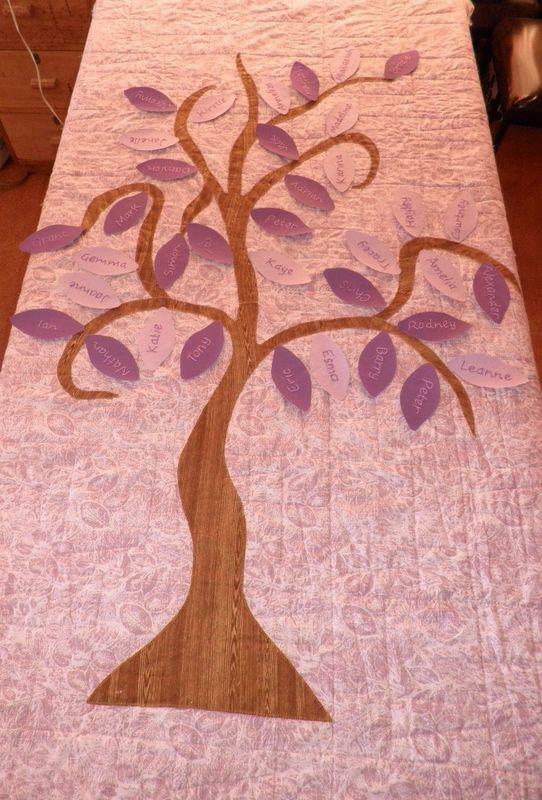 I put it on the back of a quilt as was requested, hand embroidered the names of all family members on the leaves of the tree. Each family group is attached to a separate branch. As it was a surprise gift, the birthdates of each family member were written on later when they were accurately known. 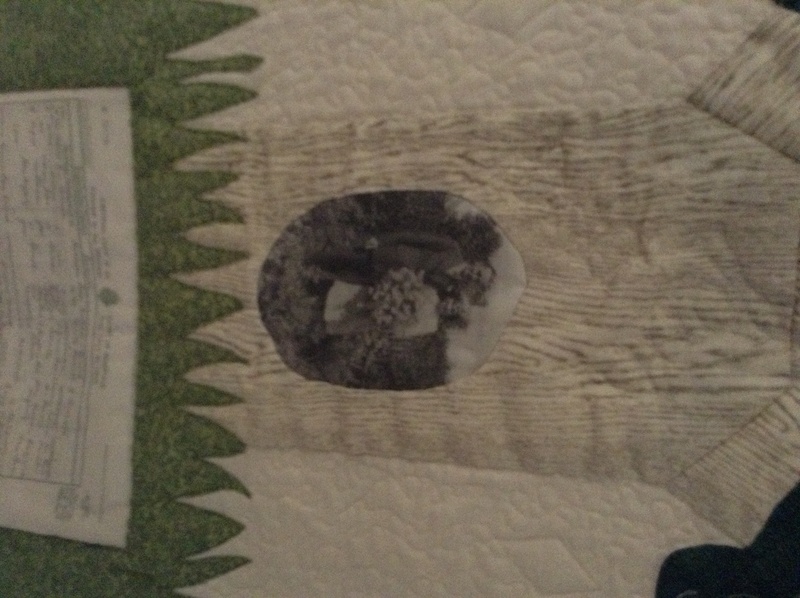 The tree and leaves were fused and then blanket-stitched around by hand. 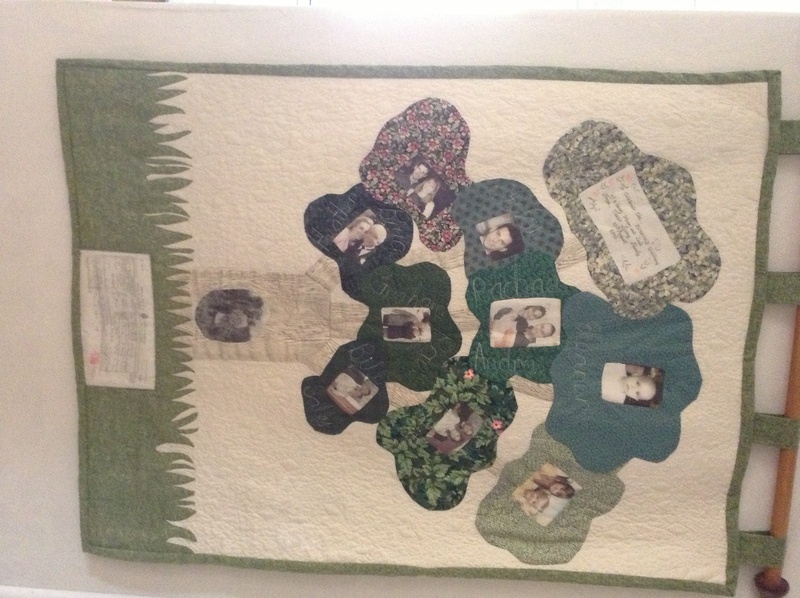 Lynnie, I love the family tree you made! 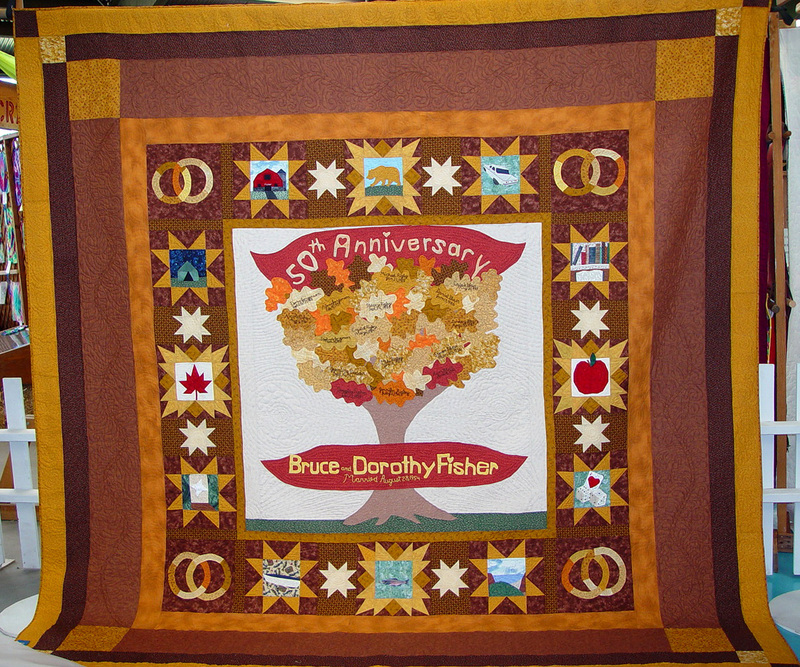 I had a commission to make a 50th anniversary quilt. I worked with the family to get what they wanted. We decided on a family tree with leaves representing family members and vignettes representing other aspects of the couple's lives. I begged to borrow it back to put it in our local quilt show. It took a blue. WOW QM! That heirloom quilt is amazing! Winnowing.com Christine Thresh has a tree one she did for her family somewhat similar to Lynnie25's. Thank you so much for the ideas! I am intrigued by the one by making it so the leaves can be added as people are added to the family. I made one for my parents Diamond Anniversary. My husband transferred family photos to fabric via his computer! This was done in 2000 ... That technology has improved somewhat now! Sadly my parents are no longer with us but the wall hanging is now displayed in my hallway.